I wrote earlier about how much I loved Christmas morning as a kid. Most of the reason, of course, was that I couldn't wait to unwrap all those presents I'd been anticipating. 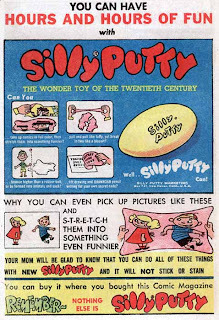 So today, I'm going to share some of my favorite toys of Christmas past. Although I went tomboy in my pre-teens, when I was a very little girl, I was obsessed with dolls. I loved them, especially the ones that were more "real." I didn't like the hard plastic dolls. Give me the soft rubber skin of Baby Tender Love. I still remember how I lit up when I realized Baby Tender Love had soft nylon "skin" that almost felt like a real live baby. I started badgering my parents to get me one for Christmas, and I suffered great angst waiting to find out if they would actually do it. When I found Baby Tenderlove lying under the tree, I was ecstatic. Technically, this was actually my brother's Christmas gift, but it didn't take long for me to commandeer Joe for my own purposes. You see, Barbie needed a boyfriend. And Ken? Kent wasn't gettin' it done. My Barbie had it bad for G.I. Joe with Kung Fu Grip. He was hairy, scarred and carried a big gun. Clearly, I was prepping to write for Intrigue even back then. They had me at "You can even pick up pictures..."
This was during my horse phase. 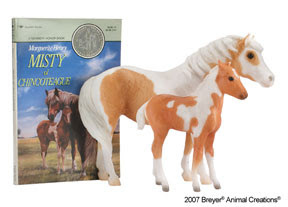 I loved the book Misty of Chincoteague and absolutely had to have the figurine. After all, Barbie and G.I. Joe needed transportation, and Joe categorically refused to ride in the pink Corvette. So, what about you? What were some of your favorite Christmas gifts when you were a kid? Tell us in the comments and I'll draw for someone to win a copy of Dani Sinclair's December Intrigue, Police Protector! Oh, my earliest best gift was Thumbalina. Don't recall if I'm spelling that correctly. Anyway, it was a doll that wiggled in her cradle when you pulled the string on her back. She had bright green tights, I think. I remember getting a fabulous blanket for my pony, Jessica, from Dad's father. And getting several Breyer horse models (always horse crazy, from the time I was quite young). The soundtrack album (vinyl, folks) of the original Battlestar Galactica. Oh, a Barbie camper. I had a Malibu Barbie, got a camper one year. Very 70s. LOL. Tons of books: horse books, Nancy Drew books. I'll probably think of other things later, but those come to mind off the top of my head. What fun, to remember! Kea, with the exception of the original BSG soundtrack album and the pony blanket (since I lived in the city and didn't have a pony), I swear I got everything else you got for Christmas at one point in my life. Can't remember for sure if it was the camper, but I got some sort of Barbie vehicle that wasn't the pink Corvette. Got the horse models, the Thumbelina, horse books, Nancy Drew Books...check, check, check. My fave toy of all time was probably LEGO. Spend hours and hours and hours with it! Some of my favorites were of course my bicycle, lincoln logs (wish I still had them, they would be worth a fortune) and a really cool slinky. Of course I always liked getting books. Hey, Paula. My brothers had a GI Joe, too, and since I never had a Ken, he was always paired with my Barbie dolls for romantic interludes! 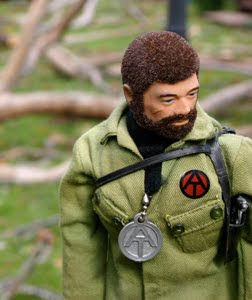 But my favorite romantic hero for my dolls was really Johnny West! My brothers and I had both Johnny & Jane and all the horses and tack. One year for Christmas my dear, sweet grandma granted my wish and gave me the Johnny West buckboard set! I was thrilled. And I still have it, tucked safely in its original box! Like you, as a kid I was prepping for a romance writing career and didn't even know it. Only I write western/cowboy romances! "You'll Shoot Your Eye Out!"